We have a wine rack, which is something that most people can claim, probably. But most people don’t meticulously organize their wine racks by price, value, and sentimental importance. Pretty, isn’t it? We love it. And we lovingly fill it with bottles of red wine. Here is the secret to our organization: we put the least expensive, least important, and least meaningful bottles at the top, and the most expensive/meaningful/important bottles at the bottom. The middle rows are only sort of important – we wouldn’t pull from these rows on a regular Tuesday – but maybe on a Tuesday when good friends are visiting or when Gardner gets an A in a law school class. Well, y’all…tonight was a Bottom Row Night. I got a job offer today!! and I took it – on the spot. It’s an incredible opportunity with an amazing company…and I’m thrilled. Can you tell? The bottom-row-bottle we picked tonight was one we received as a gift in 2008. One of our favorite wedding showers was a wine shower – a gathering of our favorite people and their favorite bottles of wine, given to us as gifts! 4 or 5 of those bottles have been hanging out on our bottom row ever since… until tonight. It was a 2004 Napa Cabernet. We swirled it, we sniffed it, and we did everything we think you’re supposed to do when you drink good wine…but mostly we just drank it happily and talked about our bright, fun future. YAY for new jobs, new friends, and good wine. Congrats! That is fabulous. 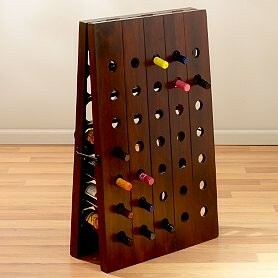 I organize my wine rack in a similar fashion. That is SOOOOO exciting!!! I want to hear all about it! Congrats! That is fabulous – and what a great shower idea!